Ostrich Pillow Review 2019: Is this Weird-Looking Travel Pillow Any Good? Are you looking for a comfortable way to sleep anywhere you want? Need a way to block out the sounds and sights around you during periods of travel? Then the strange-looking, unique Ostrich Pillow might be the solution for you. The Ostrich Pillow can be used any time, anywhere, to block out your surroundings so you can take a quick nap. Whether you travel often or just need some rest in between classes, this will help drown out ambient noise and light. It will work for people with heads of all different sizes and can also be leaned on directly like a traditional pillow, making it even more versatile. What is the Ostrich Pillow? You’ve probably seen countless people with travel neck pillows attached to their bags or draped over their shoulders. The Ostrich Pillow takes this technology to the next level, allowing you to lie not only back, but forward and to either side. This pillow is designed to surround your head like a cocoon, allowing you a comfortable, relaxing space to sleep. It has an opening for your mouth and nose in front and two openings above the head for your hands to rest. In this article, we’ll explore a few reasons you may benefit from the Ostrich Pillow, along with information about its key features, price, and more. Soft and comfortable: The Ostrich Pillow is handmade with a blend of elastomer and viscose, which creates a soft pillow for your head. The microbead filling used in its design allows you to rest comfortably against your table, train seat, or a wall. Hand washable: The manufacturers of the Ostrich Pillow recommend you handwash the pillow instead of machine washing it. Since you won’t be using a washer or dryer for maintaining it, the Ostrich Pillow should last quite a while, as handwashing is gentle and can help preserve the fabric. Covers eyes and ears: An ordinary travel pillow leaves your eyes and ears exposed, meaning you will have to use earplugs and an eye mask to block out your surroundings. 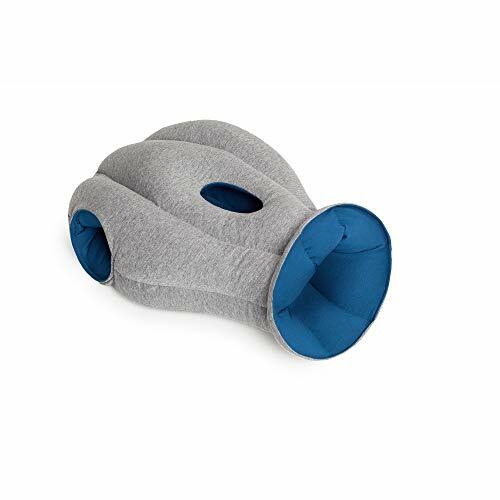 The Ostrich Pillow, on the other hand, takes care of this for you, so you don’t have to keep track of anything extra to get some rest on the go. Versatile: The Ostrich Pillow has a unique shape that makes it big enough for people with large heads but also suitable for smaller heads. And, no matter what your head size is, the quilted structure of the pillow keeps the filling in place to support your head as you rest. The Ostrich Pillow is a uniquely designed pillow made by Studio Banana Things. While it is a travel pillow, it’s not what would come to your mind when you envision a travel pillow. It has a very odd shape and design and comes in either Midnight Grey or Sleepy Blue. This pillow can be washed by hand, as needed. You can wear it with earbuds or certain types of small headphones and even some glasses. When you purchase this pillow, you’ll get a travel bag to carry it in, as well. The Ostrich Pillow comes in a variety of styles, including the Ostrich Pillow Mini and Ostrich Pillow Light, but this review will be focusing on the original design. The Ostrich Pillow is made with a 95 percent viscose and 5 percent elastomer fabric and polystyrene microbeads for the filling. The filling gives the pillow a firm and supportive feel and the pillow itself is quilted so that the filling stays in place. The product measures 5.9 by 11 by 17.7 inches overall with a 27.6-inch opening for your head. You can rest your hands in the provided holes of the pillow while lying forward on a table. The firm filling and soft, comfortable fabric on the Ostrich Pillow make it easy and comfortable to rest your head anywhere. The pillow fits loosely and is easy to get your head through and breathe while you’re wearing it. It covers most of your face, head, and neck, but users report that it doesn’t feel uncomfortable since there’s plenty of space inside it. Sleep temperature is an important aspect of resting comfortably. And, since the Ostrich Pillow covers almost all of your neck, head, and face, you might be wondering if it ends up feeling hot when you wear it. Some users have reported that it feels a bit hot but it also fits loosely enough to let some air in and keep you from getting too warm. With a pillow as unique as this, it can be hard to tell how you’ll feel about it until it arrives and you test it out for yourself. Fortunately, Studio Banana Things offers a 30-day return policy in addition to their two-year warranty, in case you aren’t satisfied with your purchase. The Ostrich Pillow shouldn’t be washed in the washing machine, ironed, dry cleaned, bleached, or dried in the dryer. Any of these harsh processes can cause irreparable damage to the pillow or at least make it wear out faster. When you need to clean this product, handwash it using water and mild soap and then allow it to air dry after. Make sure it’s completely dry before using it again or you could risk mildew. The handwashing process will make it feel new again. Note that you can’t wash the Ostrich Pillow in the washing machine. It may take up to a few days to dry completely with air drying, so make sure to plan accordingly. Clearly, the number one priority when it comes to any type of pillow is comfort, but what things should you take into consideration before investing in a travel pillow, specifically? Portability: Your travel pillow should be easy and convenient to carry around with you. While the average neck pillow may not be too much hassle, more comfortable travel pillows, like the Ostrich Pillow, may be less convenient to transport. Having a carrying bag or some kind of clip you can attach it to will be helpful, though. Durability: If you buy a cheap, flimsy neck pillow it probably won’t last you very long. As with anything else, you get what you pay for when it comes to travel pillows. Making an investment on a higher-quality product will ensure that you can take it around with you for months (or years), without it falling apart. Odor: Since travel pillows often use synthetic materials for their filling and fabric, some of them might come with a slight chemical smell. Some users report that the Ostrich Pillow has this type of smell initially. If you purchase a travel pillow with this issue, just wash it by hand and give it time to air dry in a well-ventilated room. Cost: A standard travel pillow can cost as low as a few bucks, but again, you’ll want to choose something a bit more advanced if you want to own it for a while. The Ostrich Pillow is definitely more expensive than others but may be worth the price if you travel a lot and want a durable, versatile pillow. Design: Ordinary travel pillows have a pretty straightforward design that most of us are familiar with. When it comes to a unique product like the Ostrich Pillow, however, it’s a different matter. It looks very funky compared to ordinary neck pillows which may make some feel self-conscious. Having the ability to sleep during travel can make the experience a lot less stressful, overall. The Ostrich Pillow has a high price tag and an attention-grabbing design, but very durable construction and a useful function. If you purchase the Ostrich Pillow, it comes with a storage bag and gift box, so you can give it as a present.